278 pages | 15 B/W Illus. In the World Library of Psychologists series, international experts themselves present career-long collections of what they judge to be their finest pieces - extracts from books, key articles, salient research findings, and their major theoretical and practical contributions. Jonathan St B T Evans is amongst the foremost cognitive psychologists of his generation, having been influential in spearheading developments in the psychological study of reasoning from its very beginnings in the 1970s up to the present day. This volume of self-selected papers recognises Professor Evan’s major contribution to the psychological study of thinking and reasoning by bringing together his most influential and important works. Early selections in the book focus upon experimental studies of reasoning - matching bias in the Wason selection task, belief bias in syllogistic reasoning, and also seminal work on the understanding of conditional statements. 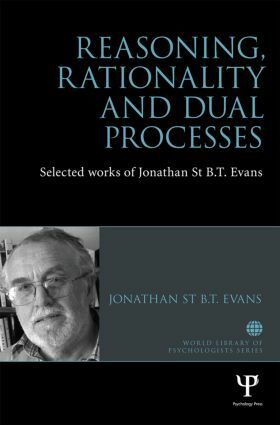 The later selections include Evans’ work on more general forms of dual process and dual system theory, and his recent account of two minds in one brain. The volume also contains chapters which highlight Evans’ contribution to the topic of human rationality, and also his influence on the development of the "new paradigm" in the psychology of reasoning. The key developments in the psychology of reasoning are paralleled by those in Evans’s own intellectual history, and the book will therefore make essential reading for all researchers in the psychology of reasoning, and a wider audience of graduate and upper-level undergraduate students with an interest in reasoning and/or dual process theory. Jonathan St B.T. Evans is Emeritus Professor of Cognitive Psychology at the University of Plymouth, UK. He has conducted research into the psychology of thinking, reasoning and decision making over the past 40 years. He is author of eight books and more than 200 scientific articles on these topics. His work includes the study of cognitive biases in reasoning and decision making with particular expertise in conditional reasoning. He is best known for his career-long interest in dual processes and systems underlying higher cognition.